It seems like only last year that Litepanels released the Gemini, a 2 x 1 soft light with high output, RGB control of hue and saturation, and built-in gel match and effects. It quickly became a popular choice. 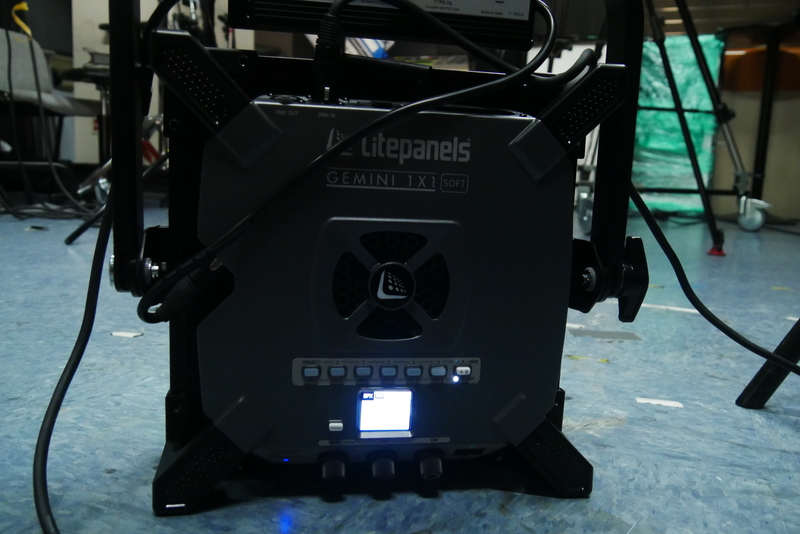 Now, Litepanels strikes again with the Gemini 1 x 1 Soft, in a variety of configurations, to match the Gemini 2 x 1. Using LED emitters like those in the original Gemini, the 1 x 1 uses a different spacing for the emitters and delivers about 60% of the brightness of the original Gemini (according to Litepanels) in something that is half the size. The light is bright, dimmable to 0.1%, with RGB control and gel matching. The removable diffusion panel provides light output with beautiful drop-off. Please note: even though the diffusion panel is removable, do not use the light without it in place, since it is required for safety and for the LEDs to function properly. The image below of the LEDs is for illustrative purposes only. 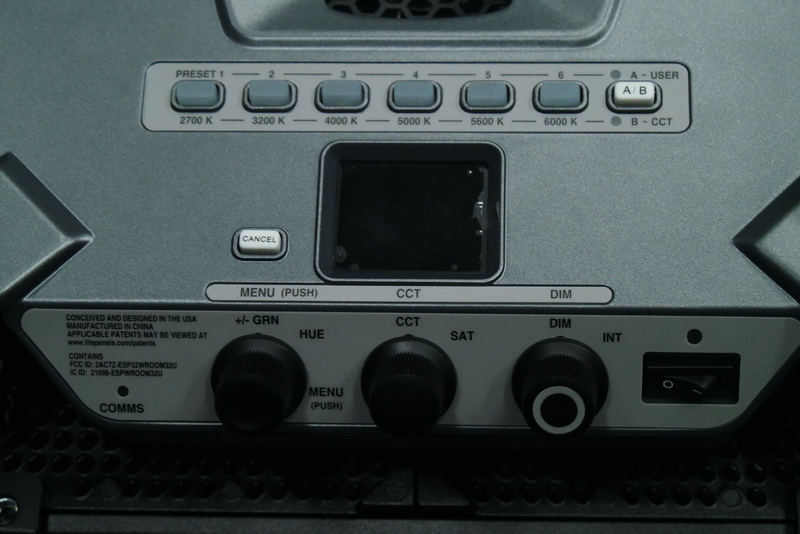 Do not operate the light without the diffusion panel in place. In the short time I spent with the Gemini 1 x 1, I found it extremely well thought out and well built. You could say it’s overbuilt, but it isn’t heavy, despite it being built like a tank. 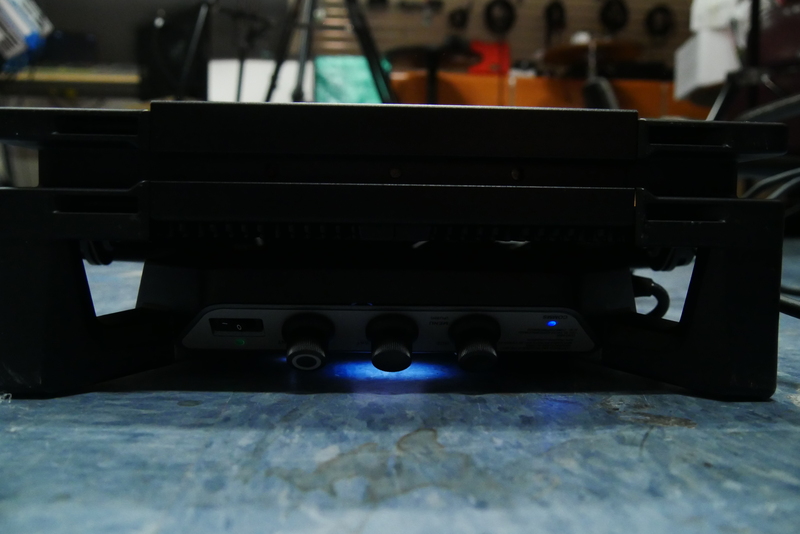 It ships with a power supply that mounts on either side of the yoke, which is nice. I expect V-mount and Gold mount battery-mounting plates will be available, but my sources can’t confirm exactly when (I expect soon after the light is released, if not concurrently). The fixture features a built-in cooling fan, and if you turn off the fan, the fixture’s output is cut by 50%. The fan is quiet and, if you aren’t putting the mic right behind the fan, I wouldn’t expect it to be an issue. I couldn’t hear the fan when standing in front of the light, although I’m not an audio recordist. It is worth noting that the light, which features a splendidly simple menu system, allows you to select from a variety of fan settings, including auto and delayed, so you can run the light at full power without the fan running—unless the Gemini 1 x 1 starts to get too warm. 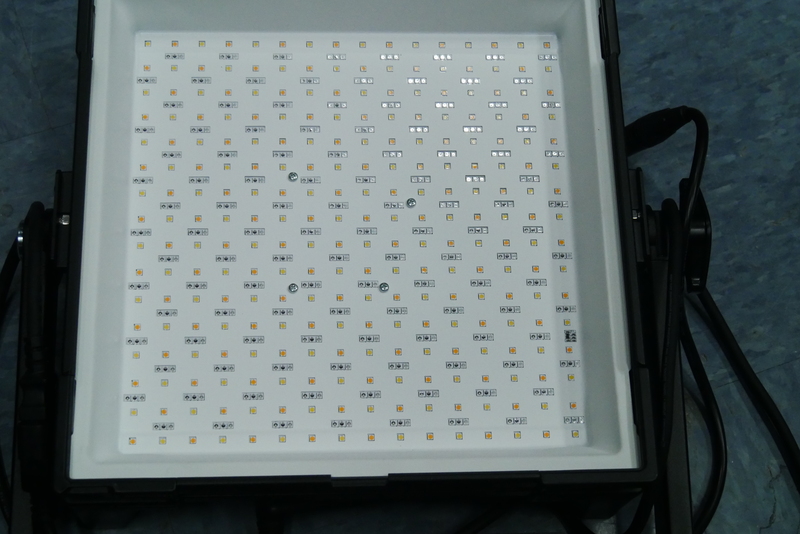 Remember: although LEDs are efficient and do not produce as much heat as an equivalent tungsten or HMI fixture, they still produce some heat, and heat is the enemy of the phosphors used in the LEDs. So, for maximum LED life, don’t turn the fan off unless it’s crucial. Just look at the light in his eyes. 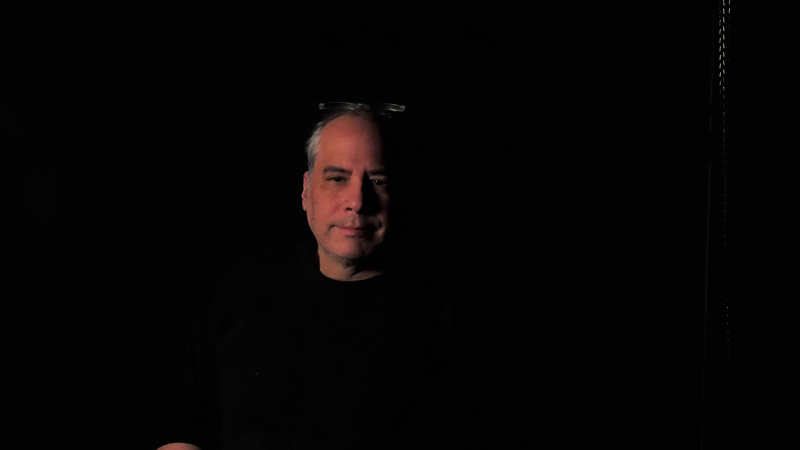 The quality of the light is just what I want, soft but directional, as you can see from the still image where our model is wearing a black shirt and standing in front of a black background. The fixture is set at 3200K and dimmed to about 12%, while the subject is standing about 4' from the light itself. 12% is down low on the dimming scale, and it wasn’t uncomfortable to have the light that close to the subject in the photo. The quality of the light is the most important aspect; the next most important aspect is how powerful the light’s output is. Remember, this photo was shot with the fixture’s output at 12%, but I could easily have cranked it up to 100%, although it would have been hard on the subject’s eyes. So, output is not an issue here. High marks for quality of light and brightness and, if that is all there was to recommend this light, then that would be enough. However, this light fixture is so much more than just a nice bright light. I mentioned that the Gemini 1 x 1 Soft was well thought out, and it is. The fixture itself is simple to use, with a single power switch, three knobs with detents as you turn, and the controls are labeled. 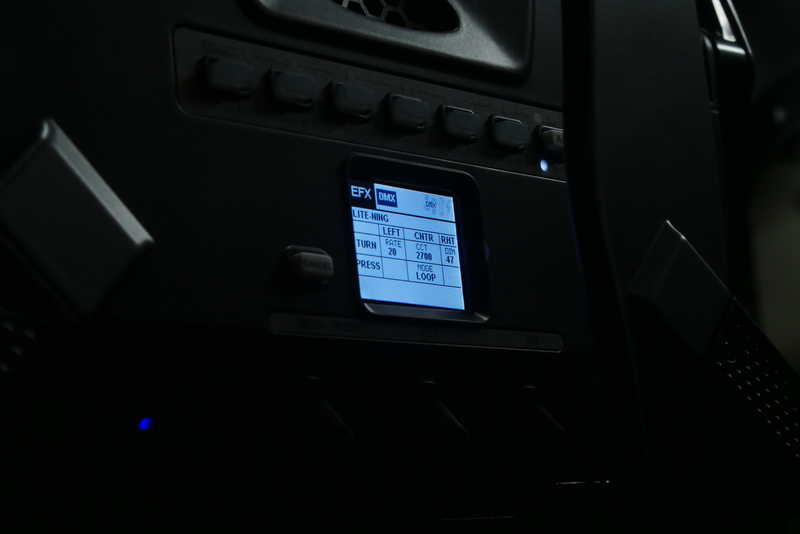 There are also six-preset buttons, from 2700 to 6000K, which light up when activated. If one of the presets is near to what you want, but not quite there, you can adjust color temperature with the middle knob—the lit preset button will extinguish, but the LCD screen will give you a readout of the color temperature. Need to adjust plus or minus green? Just use the knob on the left. If you press that knob in, you access the menu, which allows you to choose from Color Temperature, HSI, GEL Mode, RGBW Mode, and Lite Character (with which you can control the saturation curves). HSI mode gives you independent Hue and Saturation control, and please note that turning saturation to zero will not make your subjects appear as black-and-white. 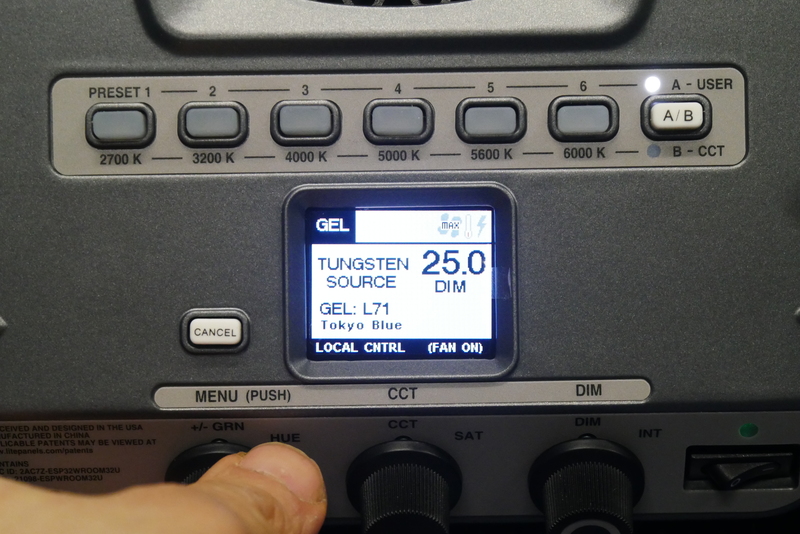 Gel mode allows you to “add” any of the Roscoe or LEE “preset gels” to either daylight or tungsten output (just turn the middle knob one click left or right to change the color temp of the output.) RGBW mode, by far, gives you the most precise control, if you understand it. You can change the color temperature of the output and then individually adjust the red, blue, green, and white LEDs. Adjustments show from 0.1 to 100, in tenths, for each R, G, B, and W. Dimming is available in all modes from 0 to 100, as well, and it is controllable and repeatable in increments of tenths. There are nine effects settings, each one customizable. The menu system is clear and simple, but if you do get lost, a handy dedicated cancel button is built in to back you out. In addition to fan speed, the menu lets you select from Wired DMX, Wireless DMX (optional), Wi-Fi, or Bluetooth (Bluetooth requires a dongle). As a side note, when DMX is connected, it will deactivate the local control. I know this because I tested it with a small 12-channel DMX board. Working with DMX? Don’t worry, it’s displayed. 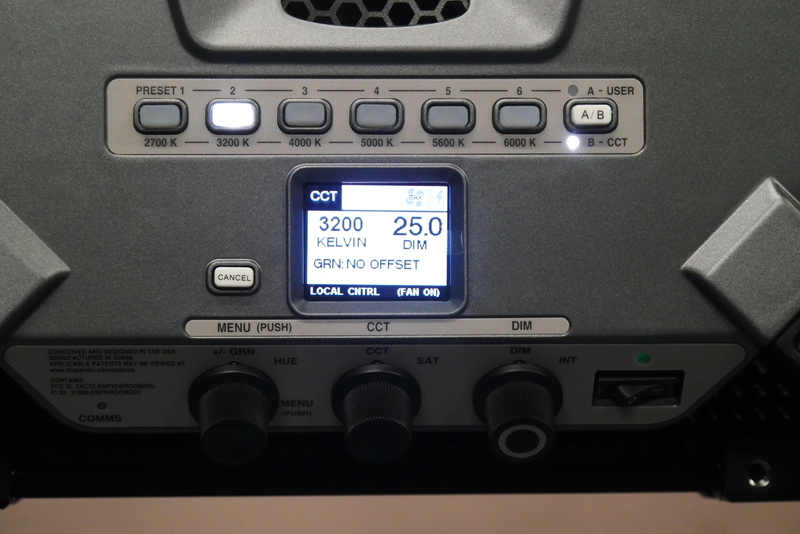 You can even select effects, and adjust their parameters using DMX. In addition to being built like a tank, the design allows you to sit the 1 x 1 Soft on the floor or other smooth surface, with no need for a stand, arm, or sandbag to set the fixture at floor height. The yoke is sturdy enough to support the light on the floor for those times you need a specific angle. You can even lay the Gemini 1 x1 on its back so the light points straight up, perfect for those shots in a cinematic bar where the table is lighting the scene. When laid flat on its back, the fan sits above the floor, and the cooling air flow isn’t obstructed. Not only that, but the local controls are still accessible, thanks to the angled design of the sides of the fixture. 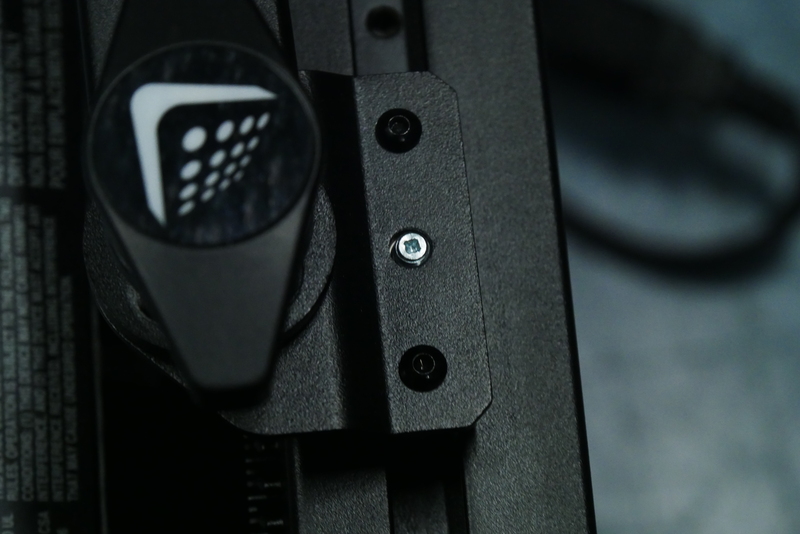 The power supply (and the future battery plates) mounts on either side of the yoke with two thumbscrews. You can also mount the power supply directly on the fixture itself because it has mounting-screw holes on the top, bottom, and both sides. However, mounting on either side of the fixture would require removing the yoke itself, which will require a little bit of mechanical savvy, so probably not recommended, even though possible. Adjusting the position of the yoke along the length of the fixture is possible, though it requires a tool. This light is detail oriented because it is flexible and easy to use, from a mechanical standpoint, as well as an electronic one. Local control is simple yet fully featured, and not only do the preset buttons light up, they are made of a soft rubbery material, which is easy on the fingers. In addition to the built-in six color-temperature presets, you can also program six user presets. Just set the light the way you want it, then put the preset selector into User mode, press and hold any of the six pre-set buttons, and it programs it to that setting no matter what mode you are in. So, if you program a Gel mode of, say, Tokyo Blue into Preset 4, and then go into CCT mode, pressing the User preset 4 will put the light back into Gel mode and bring up your selection. 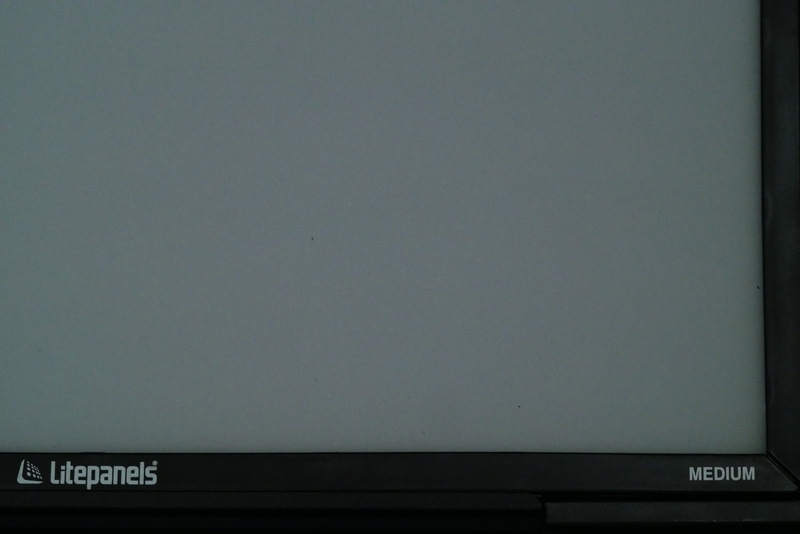 The display screen supplies you with all the information you need about what the light is doing. If you turn the light off, or lose power, your settings are saved and the light powers up in the last mode you were using. I must hand it to Litepanels. The Gemini 1 x 1 is a fine piece of gear, suitable for location or studio, and one that keeps on impressing me the more I use it. When you’re in New York, be sure to check it out in the B&H Photo SuperStore. If you have any thoughts or comments on the Gemini either the 1 x 1 or the original 2 x 1, please feel free to share them below. Was this product made in 2019? From the look of that model photo the noise looks like ISO 96,000. Can these light panels not have greater output, as to enable a lower ISO?